In the last 5 years the popularity of poker has exploded mainly because of the televised poker tournaments produced by the World Poker Tour. 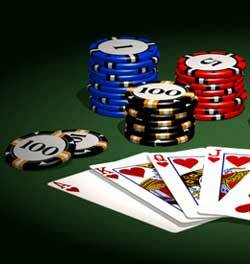 The game that is being played in casinos, online poker sites, and homes is Texas Hold’em. In addition to televised poker tournaments Texas Hold’em has taken off because it is actually a very easy game to learn. Like Mike Sexton says “the game that takes a minute to learn but a lifetime to master”. When tournaments have these problems they can take forever and many people will lose interest. Especially when it get’s later into the night and people have had a few pops the tournament can come to a grinding halt. When this happens you have people going all-in on any hand just because they are tired and have lost interest. That is not the way to run a Texas Hold’em tournament. Here are some tips to run a successful No Limit Texas Hold’em Tournament that will have your guests leaving your house happy even if they’ve lost. Of course this depends on how many people you have playing and what you plan on doing the rest of the night, but if there are 8 or more people and the focus is the poker tournament then 4 hours of play is a good time frame. Anything longer and people start losing interest. Anything shorter usually means that the blinds are too high compared to the chip stack and forces people to go all-in. It also leaves people wondering what they are going to do for the rest of the night. Blind schedules that have long time intervals or don’t progress fast enough let players fold hand after hand. This isn’t bad in a casino tournament, but at home tournaments players are looking for action. They usually play lose cards and really don’t mind if they lose their money. They are just looking for a fun night. So keep the blind intervals to 15 or 20 minutes and keep the blind value moving up steadily. Here is an example of a blind schedule if you were using 1000 chips to start. Use this as a basis for your game. You might only start with half the chips so reduce the blinds by half. Blind values should be relevant to the starting chip stack. A good rule of thumb is to make your starting blind 1/50th of the starting chip stack. I also like to introduce Antes once it gets down to the final six players. Antes increase the pot size and force players to get in the action. This is a very simple thing to do, but having a dealer button let’s everyone know where the dealer is therefore they know who is the small and big blinds. All of this helps move the game along since no one has to ask “who’s deal is it?” and “is it my turn?”. Players will be having a few pops and will need to get up from the table. A break every hour will keep the players fresh. It will let them refresh their drinks and get some food before sitting down for another hour. Make arrangements to have food arrive or ready for the first or second break. Having some hot food and snacks will keep the late night hungers away and keep everyone happy. Having food at a tournament makes the players feel like they are being taken care of and leaves a good impression. If you follow these tips and add some of your own touches to the tournament you will find yourself with a room full of happy poker players that can do nothing but talk about when how much fun they’ve had. Where else can you have a night out with your buddies, have a few drinks, dinner, and if you are lucky go home with a few extra bucks in your pocket.